Directions to Kairos Psychological, P.C. Our Address is 11905 Arbor Street, Omaha, NE 68144. 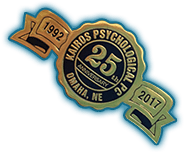 Kairos Psychological, P.C. is located near 120th and West Center Street. From 120th and Center, go east on Center one block to 119th and turn left (which is north). Go one block to Arbor Street. Turn left (which is west) and take the first driveway on your left. This will bring you to our door, which says Kairos Psychological, P.C., 11905 above it.